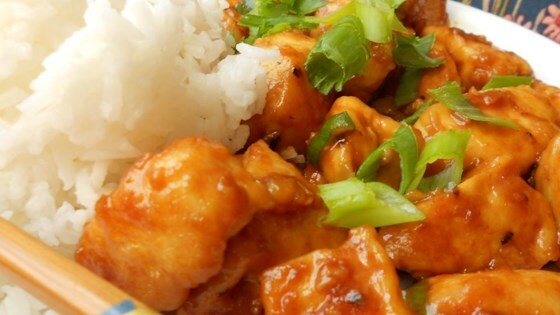 "A simple, quick recipe for Szechuan-style chicken with basic ingredients. This is usually served over white rice." Place the chicken and cornstarch into a bag or bowl, and toss to coat. Heat oil in a wok or large skillet over medium-high heat. Fry the chicken pieces and garlic, stirring constantly until lightly browned. Stir in the soy sauce, vinegar, sugar and water. Cover, and cook until the chicken pieces are no longer pink inside, 3 to 5 minutes. Stir in the green onion, and cayenne pepper, cook uncovered for about 2 more minutes. Serve over white rice. See how to make a simple stir-fry based on spicy kung pao chicken. This was too soy saucy, didn't much care for the flavor. We have updated this recipe to include 1 teaspoon of sugar as per the original submission. I added sesame seeds and a little extra cayenne pepper, and it was perfect, especially served with veggies over steamed white rice. Exactly what I was hoping for. Thanks!